Last summer I wrote a post about building a Japanese tool chest, to take some tools with me while traveling. Over the last year I’ve done a lot of green woodworking. I’ve learned a lot about wood and the tools that are needed to turn that wood into things. I’ve carved a bunch of spoons, some oak spatulas, I’ve made a couple of oak benches, and a bunch of other stuff. I’ve bought and made quite a few new tools as well. This summer we planned to go to the German Eifel to stay in a log cabin in the woods for two weeks, and I came prepared. 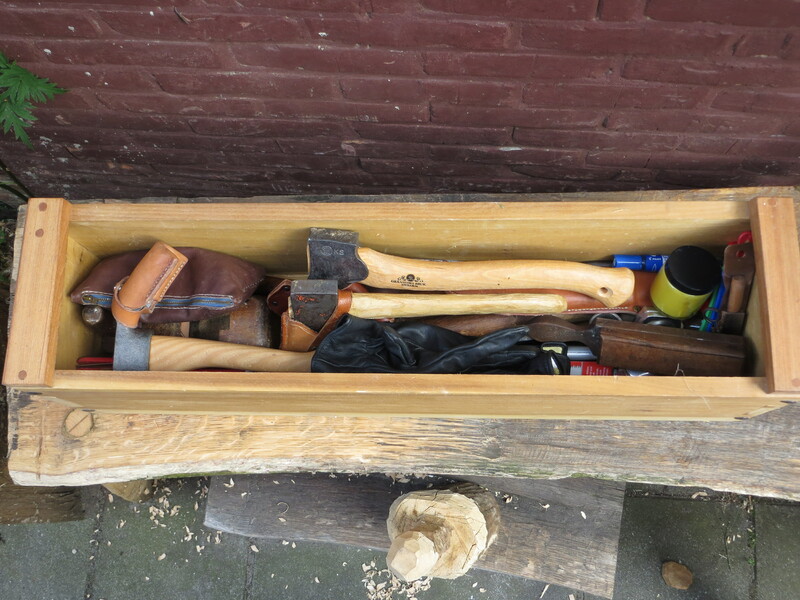 So, a year after I made the Japanese tool chest, here is my essential green woodworking kit in that chest. These tools are everything I need to make spoons, bowls and spatulas; simple green wood joinery such as stools and benches; everything needed to keep my tools sharp; and some basic leatherworking tools to make or repair sheaths or other simple leather items when needed. The pictures below were taken after our stay in the log cabin. A post about that is coming soon. The big mallet leaning against the chest was made from a hornbeam that had been taken down by a falling oak near the log cabin. -Leather gloves with kevlar lining. -Peugeot chrome vanadium chisel, 26mm. Great for making mortises in green wood. It’s stainless, holds a good edge, but is still easy to sharpen. And it’s dirt cheap. –Gränsfors Bruk large carving axe. This is a great tool, highly recommended. –Refurbished Sandvik hatchet, 600 grams, with a homemade leather sheath and a new ash handle that I recently carved. –Orikomi Folding Saw 250. The blade with the coarse teeth is usually on there, but I also have a fine toothed blade which you can see just behind the saw. –Ryoba compact 180. The nice thing about this saw is that it’s small and cheap, but can both rip and crosscut really well. It leaves a very clean and smooth surface. -Lots of sharpening stuff: a Belgian sharpening stone in a wooden box; a Slovakian Roszutec slipstone for bent knives, adzes and gauges; a DMT dia sharp mini hone set, which is basically a set of diamond files; a DMT cone file, again mainly for bent knives and such; an old combination stone, which is probably about 200/600 grit; a DMT sharpening card, 800 grit. I selected these tools because they take up little room, but still enable me to do all sharpening tasks (except for the most aggressive ones, but I try to take good care of my tools so I rarely have to be very aggressive). I always have the DMT sharpening card in my bag for sharpening on the go, by the way. The set also contains a bottle of Ballistol to protect the tools after sharpening. -(bottom left, on the lower bench) an old scrub plane. This thing is really aggressive and great for taking down stock. -A big curved spokeshave, also quite old. -An old axe head that I use as a splitting wedge. I do have actual splitting wedges, but this axe head always seems to work better for me. It’s wider, which gives a cleaner split. It’s narrow at first, allowing it to cut into the wood easily, and then it gets wide very quickly, which makes it great for splitting logs. It took three blows with the big hornbeam mallet to split a 40cm wide oak log clean in half with this. – A set of pliers, who knows when you’ll need one. -(bottom left, leaning against the bench) My Leuku. – A Pfeil adze with leather sheath. – An old 30mm auger. – (on the stool on the right) A pair of dividers. 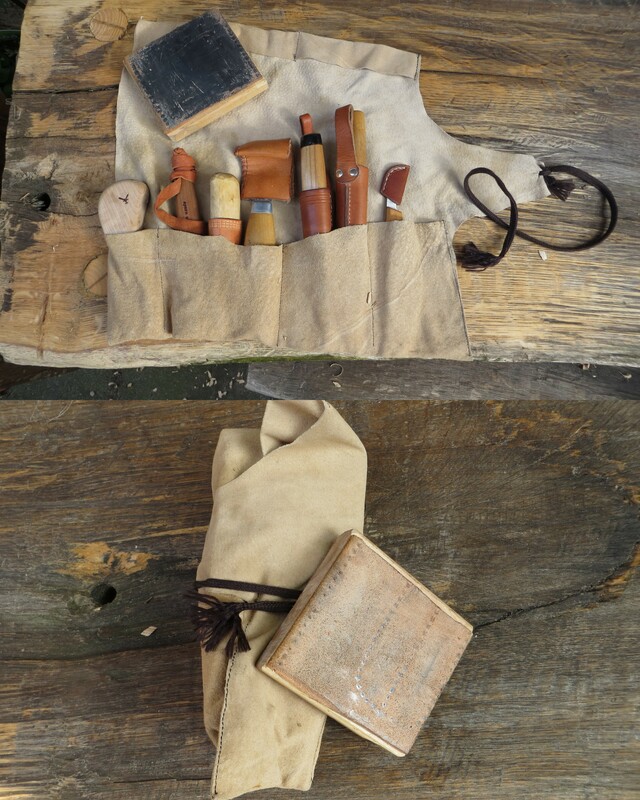 -A set of basic leatherworking tools. -A Pre-WW2 Philips “knijpkat“. Mainly for sentimental reasons. -A bunch of cotton rags, to wipe down tools and apply wax with. You may have noticed that some of the most important tools are missing on the picture and in the list above. That’s because I was using them at the time and forgot to put them in the picture. – A Hans Karlsson mini spoon gauge. I only recently bought this, and I’m still figuring it out. It’s meant for carving deep narrow bowls. – A North Bay mini bent knife. I absolutely love this tool, and I’m definitely going to buy more from this maker. – A tiny homemade detail knife based on a Bergström blade. With a leather sheath with wooden liner. – A Mora 162, my first bent knife. These don’t really have a good reputation and I don’t know why. I think they’re great if sharpened correctly. – A Puukko. The blade’s geometry make it good for finishing jobs. – A Mora Frost 137. I’m not sure if they still make these. It’s not on Mora’s website anymore as far as I can tell. I love this knife though. It’s (again) quite cheap, but very durable. It comes with a nice veg-tan leather sheath as well. – A Pfeil chip carving knife with leather sheath. – I keep the knives in a simple pigskin tool roll. The pigskin is cheap and more durable than textile, but still easy to quickly sew on a machine. I keep a little pocket size strop handy for stropping regularly while working. The strop is just a couple of pieces of leather glued onto a bit of IKEA birch board. One side is loaded with stropping compound. And still I forgot a tool. Not because it’s not important, quite the opposite. 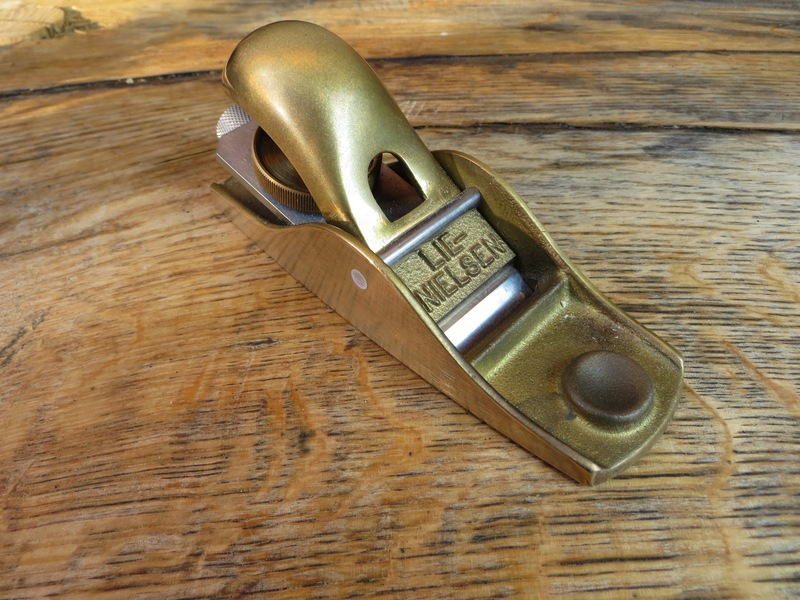 This may be one of my favourite tools: the Lie-Nielsen 102 low-angle block plane. I use this for all kinds of jobs. From the more obvious jobs, such as flattening a cutting board or cleaning up end grain, to beveling leather and rounding corners. I often clean up long handles of spoons with it as well. This entry was posted by Lieuwe in Green woodworking, Other woodworking.